Something about spring makes me think of big floral hats, kites, picnics and tea parties. Yeah, tea parties can be stereotyped with five-year-old girls playing dress up, but adults can have fun too. Here’s how. * I once saw a party planner** create a tea bar. The planner set up a variety of different flavors of loose tea leafs in clearly marked bowls. Guests had the opportunity to create their own tea combination, place the leaves into a special brew spoon and mix up a personalized cup. We live in such a non-fat, no-whip, white chocolate mocha world, that this gives your friends the chance to personalize their drink without hiring a barrista. * Apparently there is occupation out there of “tea leaf readers.” A google search may reveal some of these special trade people in your area. Tazo Tea, the brand of choice at Starbucks, has a similar concept on its Web site. After entering your favorite tea, hair color and what crayon color you prefer, a little man/tea reader will give you a line of wisdom. Ask your friends to RSVP with their answers and create tea readings as a cute present. * Tea parties should be stress free and fun. Hire some blissful entertainment like a manicurist or a make up artist. After all, these parties are early in the day, so guests will likely be heading out afterwards. * Personalize mugs are a fun favor that friends can use during the party. Sites like Kodak Gallery and Zazzle.com allow you to create cute mugs for your friends. * Small foods like mini-tea sandwiches and salads are perfect for a tea party. Just remember to keep it light and simple. Tyra's sister is getting married on Friday Night Lights and she had her bachelorette party be a tea party. 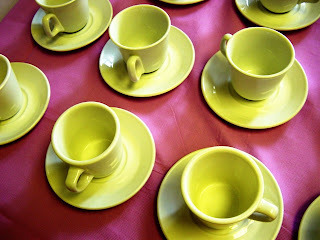 OMG - aparently there are a ton of tea parties going on across the US today to protest taxes. How ironic! ?